Κ.Α.ΝΕ. | What is OVPELO? 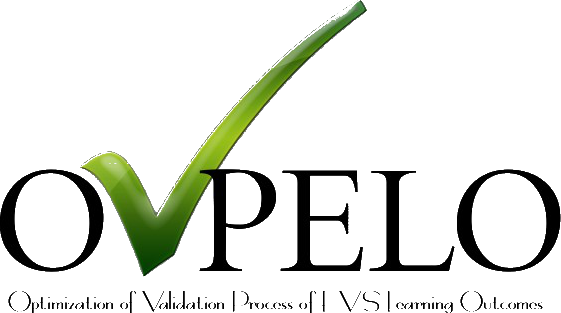 OVPELO “Optimisation of Validation Process of EVS Learning Outcomes”, is an ERASMUS+ KA2 Strategic Partnerships in the youth sector project that brings together 7 partners from Italy, Spain, Poland, Greece, Romania, France and Bulgaria. Project duration: 01/09/2014 – 31/08/2016 (24 months). Youth organizations actively involved in working with EVS volunteers have specified various problems regarding the sustainability and the recognition of the volunteering experience in its whole dimension. In general, lack of sustainability of the outcomes gained though EVS as international experience and also lack of recognition for the competences developed through are often stated by them. It has been clarified that the necessity for a validation tool, certifying the involvement of the volunteers and the international dimension of their experience, seems urgent. Moreover, no information is provided officially on how volunteers improve their competences thanks to EVS experience, how local communities benefit out of their work and in general the volunteering involvement is still not well seen within the society. Therefore, as a committed organization within the field of EVS, volunteering and non formal educational activities YouNet has decided to undertake this project aiming at establishing a strategic cross sectoral cooperation for facilitating the standardization of the procedure for validation of EVS learning outcomes. The project OVPELO strives to foster the recognition of competences gained through non-formal education and their better applicability with formal education and job market pathways. To identify a volunteer-centred quality criteria for validation of competences after EVS project completed and to test the identified criteria in diverse settings in order to promote the relevance of the volunteering experience abroad and the benefits related to it. To promote at large scale the need for standardized validation of EVS experience as a significant international learning experience. To create a network of European organizations interested to cooperate further on fostering the recognition of skills gained through NFE (non formal education). To attract and channel the interest from educational institutions and other relevant stakeholders through networking and dissemination activities. The project expects to achieve positive impact in terms of formalization of the EVS experience, certifying the real involvement of the volunteers and in this way help the optimization of the process of validation and stimulate the involvement in EVS as proof for real benefits and tangible outcomes will be created. The project expects also a better involvement of the NGO staff in providing support to their volunteers, fostering the involvement in EVS for people with fewer opportunities, stimulating the interest of the HEI, potential employers and business sector institutions in recruiting former volunteers according to the experience and competences they have gained through investing time for being EVS. The creation of network of stakeholders interested to work further on for the process of recognition of competences acquired through NFE represents also a positive outcome which will be achieved through this project, as well as the significance of the EVS experience within the society at large. The long term benefits of the project are expressed through the fostered opportunities for the young people in terms of employability and better competitiveness on the labour market as the platform will use externally set up quality criteria and it will stimulate their future involvement in EVS as tangible certification for its outcomes will be provided. Youth will gain an increased sustainability for their commitment in volunteering and better applicability of the acquired competences. The cross-sectoral cooperation initiated by this project will establish fruitful spaces of exchange of the best practices and expertise. The fact that HEI and VET providers as well as business sector and public authorities representatives will cooperate together is of major importance for the future of policy making procedures on national and EU level. The project is a step towards a cooperation which on a long term basis would impact the EU society on a larger scale and would be a way to deal efficiently with the economic crisis, the educational difficulties, as well as with problems of social exclusion or school dropout.